Wash the shrimp, peel and devein. Steam cook for approximately 4 minutes, or until pink. Remove from heat. Wash the fresh fish and cut into 1 1/2-inch cubes. Peel and chop the onion into thin strips and place them in a small, deep bowl to soak in a teaspoon of salt and fresh water for approximately 10 minutes. Drain and set aside. Proceed to chop the red pepper, yellow bell pepper, and rocoto pepper into small squares. Hand-squeeze 7 lemons into a glass (or plastic) mixing bowl. Add salt and pepper, grated ginger, garlic, and chopped basil to lemon juice and stir. Then add the chopped bell peppers, rocoto pepper, and onion. Stir in fish and shrimp then let marinate for 10-15 minutes until the fish looks white. Serve in glass cups and top with diced pineapple and grated coconut. Garnish with lemon wedge on the rim, potato or sweet potato chips and salty roasted corn. If not serving immediately, cover and refrigerate for no more than 3 hours. The first rule for preparing ceviche is to make sure all the ingredients are fresh. Never use frozen seafood. When choosing limes, be sure that the skin is shiny and completely green; these will be especially juicy. To avoid oxidation, don’t use metal utensils when handling lime. Use wooden spoons to stir and serve. Ceviche is a refreshing and delicious dish that is popular in the coastal regions of the Americas. It is considered a national dish in countries like Peru and Ecuador. There are many ways to prepare this dish just as there are many ways to spell ceviche (cebiche, seviche, or sebiche). But what makes this recipe special is the way in which the seafood is prepared. Ceviche is not cooked in the traditional sense of the word, but rather by using the acidity found in lemons or limes. Additionally the dish is typically served with aji or hot peppers, cilantro, and onions. Shrimp ceviche is typical in Ecuador and its commonly prepared with tomato sauce. The juice found in ceviche is the result of combining the citric elements with the rest of the ingredients and is called “Leche de Tigre” (Tiger Milk). 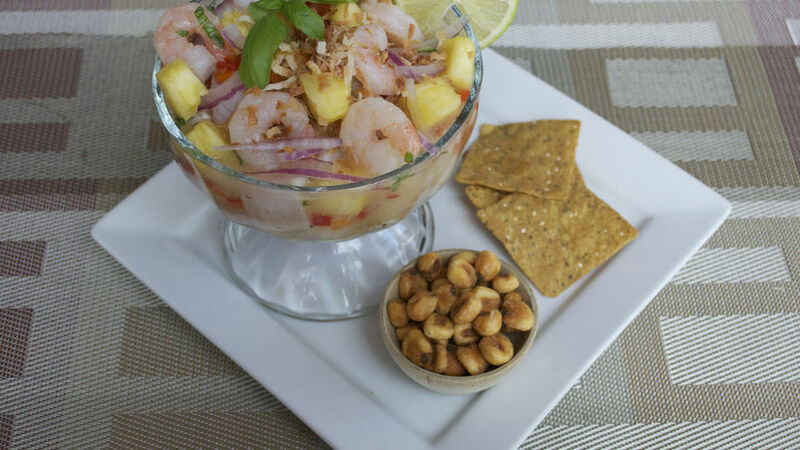 Today, I invite you to prepare a ceviche with an unexpected twist by using shrimp, fish and a delicious combination of aromatic ingredients like pineapple, fresh basil, and freshly grated roasted coconut. You’ll be instantly hooked!